This is, of course, one of our guaranteed real Sperm Whale Teeth. It is registered with the U.S. Department of Commerce as number 21-124. This gracefully curved tooth is polished only on the concave side - The convex side is left naturally rough for you to feel what it was like in its natural state. (Note: the true color of this tooth is shown in both views of the front side. Due to lighting, the color shown on the back side is a little too orange.) The tooth is 5 1/2 inches long, measured around the convex side, and 1 5/8 inches wide. It weighs 119 grams. On the concave side is scrimshawed a full-on view of the Canadian three-masted gaff-rigged tern schooner "Empress." The ship was built in Montague, Prince Edward Island by George Whitemen in 1901. It was owned in the Barbados in 1913, and was principally employed in the West Indies Trade. Included is a hand turned walnut display stand, as shown in photo. Please note that, to comply with federal regulations, our scrimshawed Sperm Whale teeth may be shipped only within the United States. 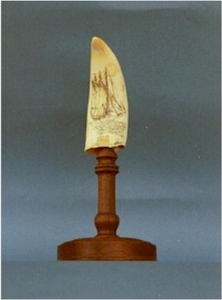 A scrimshawed Sperm Whale's tooth has long been prized as the ultimate nautical gift. There is a very limited supply of legal teeth, and this supply is diminishing rapidly.